The trajectory of the iPhone is, in most ways, the trajectory of Apple over the past decade. Insane ambition, untouchable dominance, the inevitable slowing of momentum. And now, reinvention, sort of. Mostly from iOS 7, partly from the iPhone 5S itself. But underneath it all, it's still just an iPhone. And that's still pretty good. The smartphone race has reached a point where Apple can no longer pad its lead simply by staying entrenched with its existing product—competition has caught and in places passed it. And that, in turn, means the phone in your pocket will be evolving a little more rapidly than it has in the past. A new software design, fingerprint unlocking, broader motion sensing, even the continued evolution of Siri—these are the sorts of leaps forward that Apple is usually content to let others test out before giving its own refined take. The result is a mixed bag. The iPhone 5S is literally just an iPhone 5, with a slightly different home button. It comes in gold now. 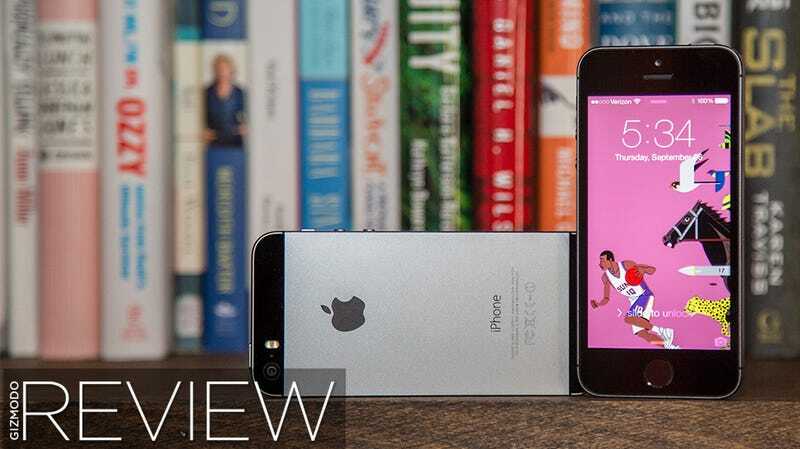 If you're somehow unfamiliar with the iPhone 5, here is all you really need to know: It is impossibly light, the display is smaller and more narrow than most popular Android phones, and it is chamfered to high heaven. Whatever else it is, the iPhone remains a gorgeous phone, one that's as satisfying to hold and use and look at as any piece of electronics has the capacity to be. It's thin, light, solid, regrettably scratch-prone, on the fragile side if not outright brittle, and all the other things you know iPhones to be. That's a little boring, but it also works. And so Apple plays the hits. The screen is the same retina display you're used to. It's been outstripped in size and pixel density by other larger and more powerful phones, but you'd be hard pressed to point out any flaws. The size, weight, and general shape are all the same old Apple standards. We like them. They're not going anywhere. In fact, if you want to find change here, you're going to have to look inside. TouchID, Apple's fingerprint scanning security system, just works. Remember how that feels? It's simple and convenient and never feels like an imposition. Every time I'm asked for the thumb ID, it feels like a shortcut. Oh, I'd have to input a whole damn password here, wouldn't I? It's almost like MagSafe, in that it takes a small not-really-an-inconvenience and makes it easier, better. Wet fingers—after just washing your hands and drying them on your pants, say—don't work so well, but we did find that eating chicken wings and having gross, orange fingers was just fine. So there's that. There's another piece of hardware in the iPhone that hasn't been talked about nearly as much, but is maybe even more important than TouchID. The M7 processor is supposed to make your iPhone come alive. At the announcement event, Nike showed off a new app that would turn your iPhone into, basically, a Fuel Band you carry around in your pocket. The phone would pick up the fine movements of your body, but because that information would be routed through the M7 chip instead of the main processor, the effects on battery would be minimal. That functionality, from Nike and anyone else using the M7, isn't in use yet. We don't know how well it will work or how accurate it will be, but that it wasn't ready for launch isn't the best sign. These are natural growing pains, but they fold into a larger trend of Apple just not getting things right the first time around. Siri, Apple Maps, and now whatever's going on here. It's a shame that the battery-saving M7 hasn't really kicked in yet (or maybe a good thing, depending on how well it works), because the battery is crap. The 5S doesn't last as long as the Moto X or Galaxy S4, but the gap isn't huge. It's crap, mainly, because I think about battery every time I use it. With background updates off on non-essential apps, I'd get to around 5 or 6PM before the phone was flat dead on moderate use. A little longer on light use, and far, far shorter when I was screwing with it constantly (obviously). But that's not good enough. Sure, you can use a battery pack to top off throughout the day if traveling, or charge throughout the day at your desk (if you work at a desk, yuppie). But the primary feature of your phone should always be its ability to turn on, and that's an area the iPhone lags behind its major competitors, and is lapped, twice, by brutes like the Razr Maxx. There's a new processor here, too, an A7 chip doesn't really bear mentioning. Yes, it's faster, in the way that processors tend to get faster from year to year. It's not a transformative feature, and the 64-bit jump isn't going to do you much good in the near future. You can read about some of the interesting things going on under the hood here, and down the road, the shift in course will prove crucial. But mostly, don't sweat it. The phone's fast. That's all you really need to know. If the iPhone tracks the trajectory of Apple as a whole, the iPhone camera over the past few years has played that out in miniature. Beginning with the iPhone 4, the iPhone's camera has been the best, by reputation and often by reality. But over the past year, it's been caught and surpassed by competitors like the Lumia 1020 and the HTC One. It's still perfectly good—great, even—for a camera phone. But it hasn't been the best in a while. Nuts and bolts, the camera is fast—especially if you're used to the longer shutter times of a smartphone like a Lumia with optical image stabilization—and takes sharp images. The tradeoff is that it doesn't do quite as well in low light. Its dual flash is a particular disappointment, since Apple played that up as a major improvement. It's not. It washes faces out like all the other LED flashes, and gets stomped by Nokia phones with Xenon flashes, like the Lumia 928 and 1020. Here's a small sample gallery of some shots from the phone. The colors are a little less saturated than we're used to seeing from an iPhone. While the controls on the new app aren't as granular as some camera nerds would like, they're plenty good for the rest of us; the HDR setting ("high dynamic range" for shots with both bright and dark sections) being right at your fingertips is nice. The "standout" new camera feature is probably the 120fps slow motion video setting, which is pretty cool actually, but mostly a fun novelty. It works by just shooting a video as you normally would, on the slow motion setting. Then you open the video and slide the bars around to pick which portion of the video is in slow motion. It works! Pretty well, actually. Maybe you'll use it at dumb college parties or recording your kids play sports. But will you really? Here's the thing: This is a great smartphone camera. But it still exists within the paradigm of smartphone cameras taking very good throwaway pics—not the ones you want shot to last. The Lumia 1020's existance (I know the 808 PureView was out, but it wasn’t viable for most people) changed that. The whole idea of how you use a camera in a phone is different now. Not being the very best isn't a crime—it's size constraints and less-than-superb processing here—but the next big jump has happened, and the iPhone isn't on board just yet. For the first time since before the App Store, really, iOS has room to grow. Maybe it won’t be as broad as Android or as lightweight as Windows Phone, but all the tools to make iOS as information-dense and functional as the other guys are here—it's just a matter of figuring out how to use them, in some cases. Still, despite the extreme makeover and new stuff bolted on, it's the iOS you remember. iOS 7 still feels more welcoming than Android, which is alive and efficient but never really easy. But beyond the talk about the icons (dreadful in spots, but you stop noticing it—short praise but true) and flatness, the issues thing about the design that stands out after a week or so is the openness. That is, in place of traditional buttons, a lot of apps now just have some text. Done or Back, for example. The result is the whole OS feels less claustrophobic, but tapping buttons can be more hit and miss than you're used to, maybe because devs aren't used to enlarging the touch target for iOS. Small issue, but it's there. Lots of features seem like they were barely thought through. Wasteful, stupid, but with room to turn into something truly good and useful. Let's take the new Notification Center as an example. The information organization doesn't make any sense. It displays the day of the week and the date in large type, and then underneath, the temperature and weather forecast, written out. This is not useful. Why would you need to know the day of the week so immediately? Why not have temperature and an illustration of the weather most prominent, or the time, or your most pressing upcoming event? The whole Calendar widget is similarly idiotic. If you have a schedule slammed with meetings, events, lunches, and dinner plans, every day, hey this is great. But when you don't, the widget stays on your Notification screen, empty, just taking up space for no reason. And notifications themselves are split into All and Missed subcategories, which are inscrutable enough that I'm still not totally sure what the difference is. These are part of a long list of small, frustrating things about the OS that will probably be sorted out eventually. But they're real enough for now, and raise two quick points. One, these are the misfit-toy problems that Android stared down for years, only without the broad customization offered by that platform. And two, for the first time in years, it's a little exciting seeing what the jailbreakers will come up with. If they're taking requests, the keyboard would be a good start. It's insane to not have any form of Swype text entry in 2013. It doesn't matter what it costs. Spare no expense. If you need to pay Swype a billion dollars and every last Baby Gap t-shirt in Jony Ive's closet, by god, give it to them. The iPhone is still a beautiful phone, and iOS is more functional than ever. The redesign of the software makes it feel fresh, even though the phone looks more or less the same as last year. TouchID really works, and it's a huge convenience. The camera is good, but its flash is a disappointment. Battery life isn't good, especially compared to some of the behemoths out there. And in places, iOS 7 feels unfinished, or poorly thought out. A further note on the A7 processor: I played a good bit of Sword and Sorcery, Badland, The Walking Dead, and Liberation, and got no slowdown at all, which is what you'd expect, but still good to know. In fact, the phone didn't stutter once while I used it—not during multitasking, not while running older, non-optimized apps, just not at all—which you can't say about some other standout phones like the Moto X. Call quality is loud and clear (Verizon), and I didn't get any dropped calls, even death-gripping it up and down while using a headset. For speakerphone, the phone itself is loud, and I was able to talk at a conversational tone from across a quiet, medium-sized office and be heard fine. The new FaceTime camera is really clear. It's one of the first things we tested, since FaceTime is the first thing you mess with when a bag full of iPhones shows up at your office, and it's a nice, noticeable improvement. There was one time (today, actually) where the TouchID sensor just refused to accept my finger. I entered the passcode and re-locked the phone, and it's been fine since, but it does introduce the worry that it might break down over time. If you wake up your phone with the phone button (which apparently everyone does) you can just leave your finger on the sensor and it goes right to your homescreen. This is usually hugely convenient, but sometimes a pain if you just want to look at information on the lock screen. The 5s is full of contradictions. It's iterative, boring, gimmicky, while at the same time taking the first, unsure steps into making the kind of smartphones and software Apple isn't already dominant in. Which is all-important for the company, but less so for what's in your pocket. To you and me, the iPhone 5S is a great phone. It's not perfect, though. If you're a photo nerd or a customization buff, edge toward a Lumia or the Moto X. But most people know, generally, what an iPhone is like. And if that's something you want, then yes, buy this. It's the best and most convenient version of the iPhone yet.